Fox News Channel's parent company fired Bill O'Reilly on Wednesday following an investigation into harassment allegations, bringing a stunning end to cable news' most popular program and one that came to define the bravado of his network over 20 years. O'Reilly lost his job on the same day he was photographed in Rome shaking the hand of Pope Francis. The downfall of Fox's most popular — and most lucrative — personality began with an April 2 report in The New York Times that five women had been paid a total of $13 million to keep quiet about disturbing encounters with O'Reilly, who continued to deny any wrongdoing in a statement hours after he was fired. Dozens of his show's advertisers fled within days, even though O'Reilly's viewership increased. O'Reilly's exit came nine months after his former boss, Fox News CEO Roger Ailes, was ousted following allegations of sexual harassment. 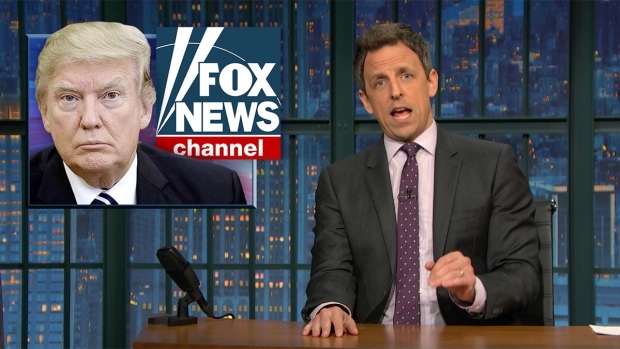 In light of the recent sexual harassment allegations against Bill O'Reilly, Seth Meyers unwraps the relationship between President Donald Trump, O'Reilly and Fox News. Following the Times story, 21st Century Fox said it had asked the same law firm that investigated Ailes to look into O'Reilly's behavior. 21st Century Fox leaders Rupert Murdoch and his sons Lachlan and James said in a memo to Fox staff that their decision to ax O'Reilly came following an "extensive review" into the charges. "I understand how difficult this has been for many of you," Rupert Murdoch said in a memo to Fox staff. O'Reilly, denied a chance to say goodbye to his Fox viewers, did so via a statement. "It is tremendously disheartening that we part ways due to completely unfounded claims," he said. "But that is the unfortunate reality that many of us in the public eye must live with today. I will always look back on my time at Fox with great pride in the unprecedented success we achieved and with my deepest gratitude to all my dedicated viewers." O'Reilly's dismissal doesn't signal any change of direction for the network: Fox said conservative pundit Tucker Carlson would move into O'Reilly's time slot — the second time in three months he's replaced an exiting prime-time personality. Carlson, a veteran who has hosted shows on CNN, MSNBC and PBS, had taken over for Megyn Kelly in January when she announced she was moving to NBC News. "The Five," a talk show with five rotating hosts that regularly airs at 5 p.m. ET, will move into the 9 p.m. time slot. Eric Bolling will host a new show that airs at 5 p.m. starting next month, the company said. O'Reilly, 67, had ruled the "no spin zone" on television with a quick smile and an even quicker temper. He pushed a populist, conservative-leaning point of view born from growing up on Long Island, and was quick to shout down those who disagreed with him. Fans loved his willingness to talk back to power or point out hypocrisy among liberal politicians or media members. 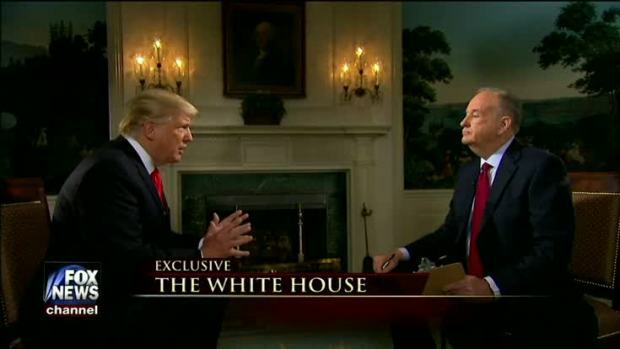 President Donald Trump said he respects Vladimir Putin during an interview that aired Sunday on the Super Bowl pregame show, and when Fox's Bill O'Reilly called the Russian leader "a killer," Trump added that the United States has many of them. O'Reilly and President Donald Trump are both "crowd-pleasing showmen who know how to signal to loyalists in their audience that they are not taking themselves quite as seriously as their detractors are," said news consultant Andrew Tyndall. "Half of the fun that they have with their audiences comes from watching the outrage that they manage to provoke." "What Rush Limbaugh was to talk radio, Bill O'Reilly has been to conservative television," said Mark Feldstein, communication professor at the University of Maryland. "You can't underestimate the influence and the profits that he brought into Fox News for all these years and that's why they hesitated so long in doing the right thing." His show generated $178 million in advertising revenue in 2015, according to Kantar Media. Before the advertising boycott, there was the prospect of even more: his audience was larger in the first three months of 2017 than it has ever been. With a profit center gone, 21st Century Fox stock fell almost 1 percent Wednesday in heavy trading. O'Reilly's pugnacious personality wasn't just an off-screen affectation, with one of the settlements going to a woman who complained about being shouted at in the newsroom. One harassment case, from a former producer who said O'Reilly called her and described sexual fantasies and appeared to be masturbating, dated back more than a decade and was widely reported then. While O'Reilly survived then, the accumulation of cases outlined in the Times damaged him much more extensively. For Fox executives, it wasn't clear when it would end: a campaign to target advertisers was continuing, a group of women demonstrated in front of Fox's headquarters Tuesday and another woman, a former clerical worker at Fox, called a harassment hotline and accusing the host of boorish behavior. Vatican spokesman Greg Burke confirmed O'Reilly was in the VIP section for the pope's Wednesday appearance. Francis always swings by the VIP seats at the end of his audience for a quick round of handshakes. A photographer from the Vatican newspaper L'Osservatore Romano snapped a photo of Francis reaching out to shake his hand.